"To one we have read about, but never saw in action. He remains an immortal to all lovers of the great game." A card thus inscribed was placed, with a bunch of red roses, beneath a life-size bronze cast of Victor Trumper by Louis Laumen as it awaited auction out front of the Melbourne office of Christie's about 10 years ago. The card was unsigned, the sentiment was universal. Though the second of November marked 132 years since Trumper's birth, he maintains a subtle hold on Australian imagination: the cast eventually fetched a record price of A$76,000. Sir Donald Bradman tops all polls as a symbol of national pride; Trumper has more romantic resonances. Bradman has been the subject of numberless books, all of which manage to say the same thing; Trumper has featured in a single representation that is nonetheless multifaceted. The image in question is, of course, the one by George Beldam, the Middlesex batsman and Edwardian photographer. George Bernard Shaw once likened photographers to cods, needing to spawn in millions so that one offspring might make maturity; Beldam seems to have done rather better, producing from merely thousands of pictures an offspring that is still going strong after a century. The photograph was recognised at once as a classic. Beldam himself turned out 500 signed copies from a photogravure. It hung on the wall in Captain CB Fry's home at TS Mercury on the Hamble River, and on the hessian partition of a cottage occupied by Sydney urchin Arthur Mailey. For many years it featured on the cover of the New South Wales Cricket Association's annual report, and it remains the basis of the design adorning the cover of the Australian Wisden. It has been a motif for artistic enterprises as diverse as the Royal Shakespeare Company production of Graham Greene's The Return of AJ Raffles and "Victor Trumper's Everlovin' Pop and Soul Revue" by Australian rock band You Am I. It has been turned into a print by Archibald Prize finalist Dave Thomas, a letterhead by Australian cricket bookseller Roger Page, the symbol of a chatroom called the Victor Trumper Cricket Board, and features on the jacket of Endless Summer, an anthology of writings about Australian cricket from the Wisden Cricketers' Almanack. At the simplest level this is because Beldam's Trumper, in composition and content, is a very great photograph. It is both the first and last word in batting, insofar as batting consists of making instinctive what begins as a set of quite unnatural motions. In this image Trumper seems to achieve the complete reconciliation of the orthodox and the spontaneous, the rehearsed and the original, the conscious and the unconscious. His shirt seems both loose and taut; his arms appear both gloriously free and tensed for action; the stroke is both instantly recognisable and uniquely his. In Great Cricketers: The Age of Grace and Trumper, Beldam's son George Jr suggests that the subject is intrinsic to the photograph's power. "Would the result of this picture have been quite the same if the subject had not been the very man declared by all who saw him to be the most beautiful to watch, and whose charisma bewitched and enchanted even his own family of fellow-players? The answer must be: no." Perhaps, perhaps not. This view may underestimate the enrichment of Trumper's legend by the picture itself. Beldam Jr was right, though, to suggest that the photograph is of an era as well as of an individual. If it is possible for a cricketer to be his period, rather than merely part of it, Trumper is the Golden Age of Cricket. In the gaiety and gallantry of his strokeplay, the charm of his personality, even in his frailty and transience, and in the suddenness of his death, Trumper personifies what we understand as the values and nature of his time, both in absolute and comparative terms. 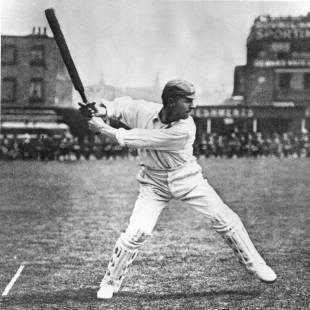 Neville Cardus found what he regarded as the decadence of his own age while studying Beldam's Trumper in the upstairs tea-room at The Oval: "A certain English batsman, vintage 1950, looked at this picture in my company and said: 'Was he really any good?' 'Why do you ask?' was my natural question. 'Well,' said this International, 'just look where he is - stumped by yards if he misses.' This sceptical England batsman had never in his life been so far out of his crease." There is, of course, more to Trumper and his period than meets the eye in Beldam's image. The abandon of the stroke is not an altogether faithful representation of Edwardian cricket: it had its gross and greedy sides too. The Golden Age in Australia has also been particularly misread, being thought of as more or less akin to England's. As fine a writer as Mike Marqusee has been guilty of casually erroneous history, describing "control of the game" in Australia as being a "battle... between Anglophile officials and the more 'Australian' working-class players and spectators". Which is the sort of analysis that gives Marxism a bad name. When it mattered, before the First World War, the contest was actually between two bourgeois castes: the players stood, more or less, for unfettered capitalism and entrepreneurship; the officials represented the forces of bureaucracy and centralisation. Australian cricketers on tour in England were as interested in money as those today: they appointed their own manager, split the gate proceeds at tour's end, and pure joie de vivre was not the only explanation when they played entertaining cricket - it was also good box office. The difference to today is that Trumper's generation did not consider themselves professionals - professional cricket was an English phenomenon. In the midst of a wrangle between the players and the new Australian Board of Control in May 1907, an interviewer from the Sydney Sun specifically challenged Trumper with the description: "The charge is that you are professional cricketers." Trumper retorted: "If we were, the inducements in England would soon take us there." And Trumper spoke with authority, having declined an offer from Lancashire five years earlier. Even though he is known primarily through a photograph taken by an Englishman in England, it is necessary to understand Trumper in an Australian context. In Australian thinking he became proverbial. When Australia's great general Brudenell White joined the British Army, official war historian Charles Bean lamented: "We have lost our Trumper." His name, as well as his reputation, was designed to live on. The first sailor to reach admiral's rank in the Royal Australian Navy was Victor Trumper Smith, born in 1913. It is not clear whether Trumper influenced the Bradman family's naming Don's brother Victor, but it would be a piquant link between the two paramount heroes of Australian batsmanship. What he denoted to Australians, though, was not merely sporting hero, but self-made Australian sporting hero. As the historian Bede Nairn put it, Trumper "reworked the charter of cricket from a Victorian artefact into an Edwardian palimpsest, with spacious Australian flourishes all but replacing the English script". Trumper was tutored as a junior by Charles Bannerman, Test cricket's first centurion, but proved uncoachable. Writing of Trumper's youth in Town and Country Journal in January 1913, SH Bowden recalled Bannerman's unheeded entreaties ("Leave it alone, Vic; that wasn't a ball to go at") and eventual decision to let the boy do as he pleased. The characteristic lasted. Monty Noble described it as Trumper's capacity for listening politely and attentively to all advice but going "his own sweet way". Trumper connects with an Australian tradition of autodidacticism - one that subsequently also enfolded Bradman. His immortality is not only manifested in the legend of his genius, it is reflected in the abiding Australian belief that individual flair and natural talent will out.